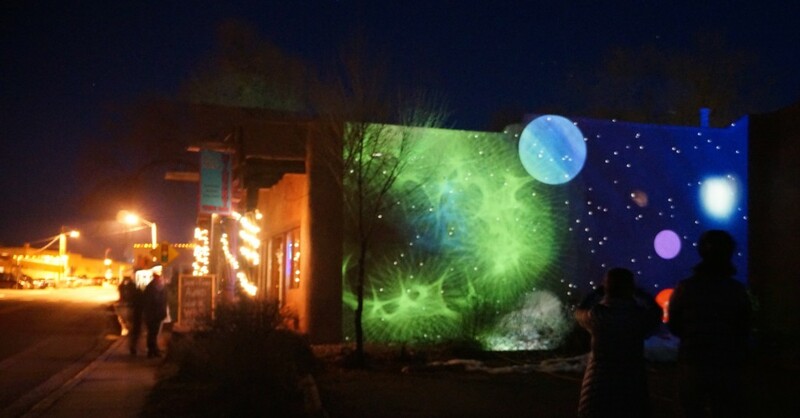 Projecting Particles at Harwood Art Museum, Taos, NM. Student projection for Lighting of Ledoux public event. 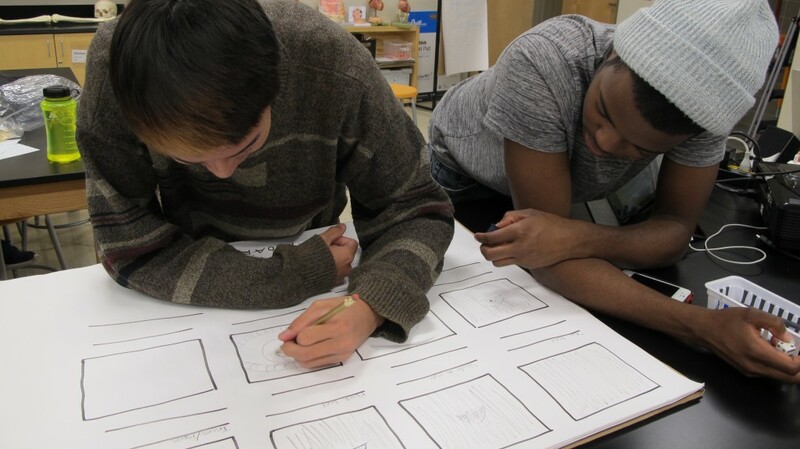 Boaz and Cade demonstrating storyboarding for Particles workshop. 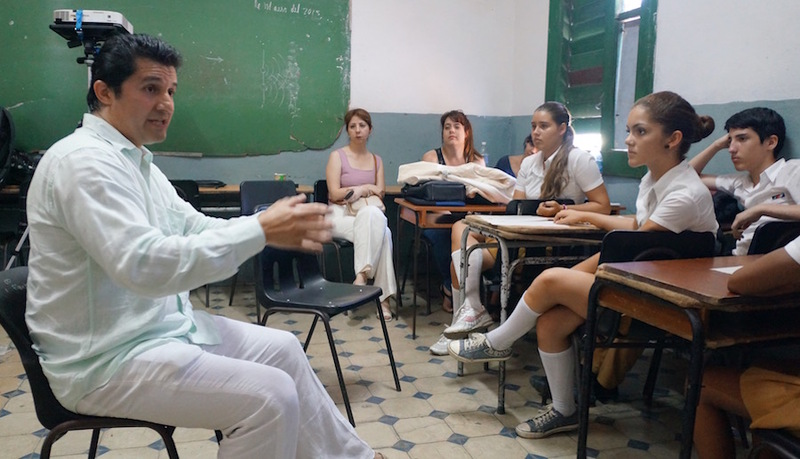 Dr. Luis Flores Castillo discusses particle physics with Havana high school students. 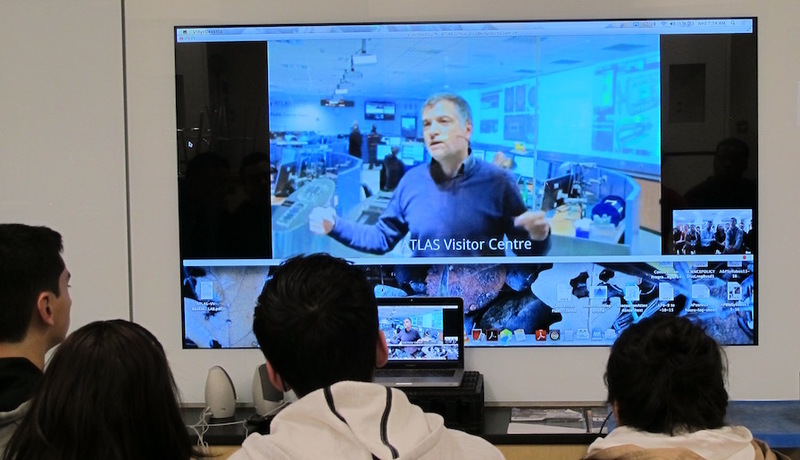 CERN physicist, Dr. Steve Goldfarb leads a virtual tour of ATLAS Control Center with Taos High School students. 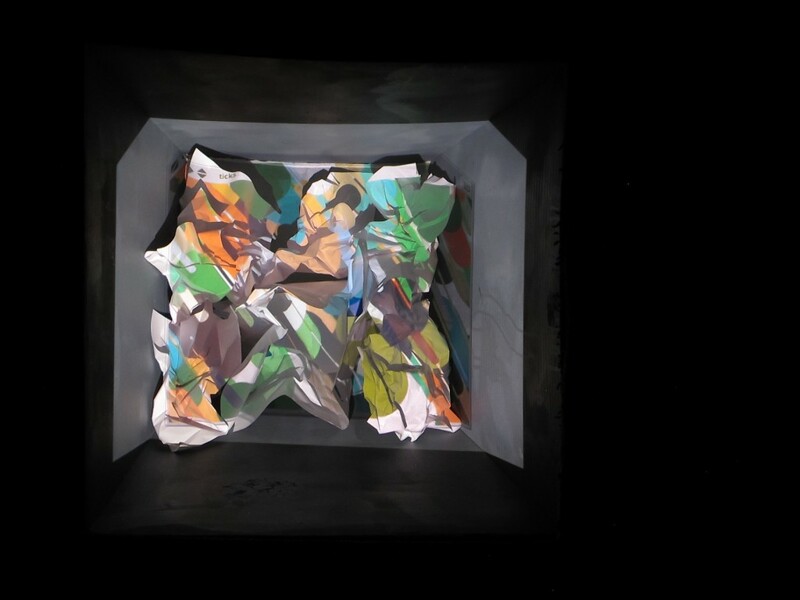 Projection Mapping test by STEMarts LAB Coding Team. Invent Event. Painting the maker station. Cade Harris and Melanie Redmond. Painting the maker station for the Invent Event Maker station/projection cube. Cade Harris and Melanie Redmond. Designing the Projection Cube for Invent Event. Aryana and Melanie. Designing the Projection Cube for Invent Event. Aryana Zarazua and Melanie Redmond. 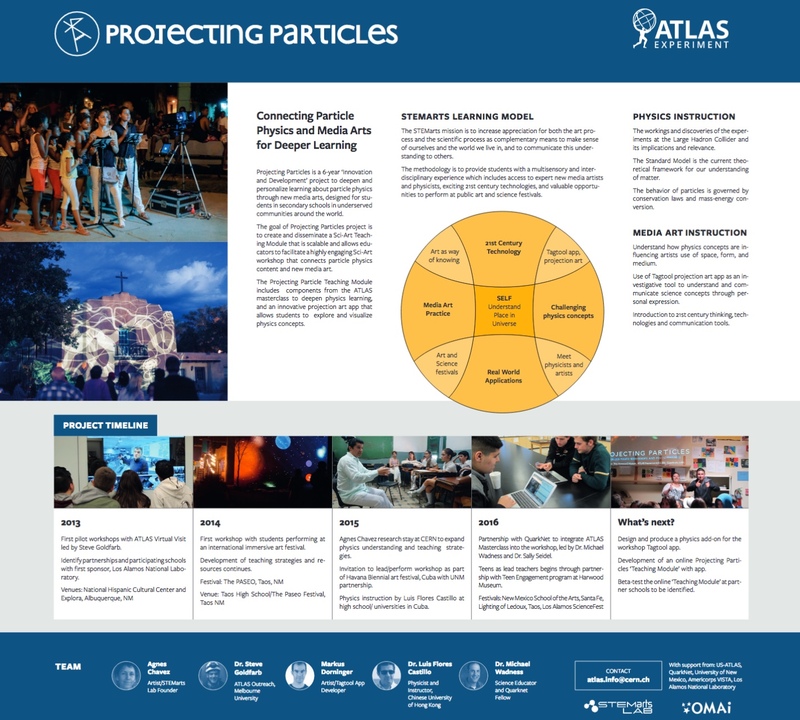 Through a partnership with ATLAS Experiment at CERN, home of the Large Hadron Collider, students travel virtually to the ATLAS control center or experience face-to-face visits with physicists to learn first hand about particle physics. 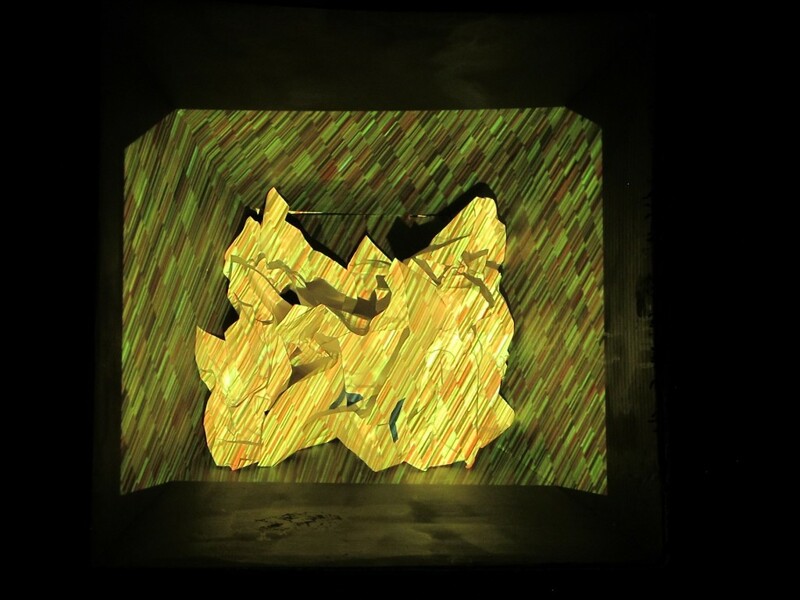 They explore projection art and cutting edge interactive installations and discover how radical new theories in particle physics can expand their approach to space and time and the world around them. 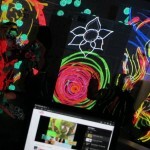 Students learn to create their own projection art using Tagtool, an iPad app developed by artist Markus Dorninger/OMAI. 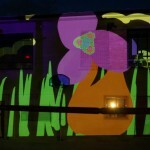 They storyboard and choreograph a live projection on to a building and video/photo document their physics-inspired work. The Projecting Particles project was presented as a poster session at the 38th International Conference on High Energy Physics (ICHEP). The presenter was Dr. Luis Flores Castillo, the physicist who was part of the Projecting Particles team invited to the Havana Biennial 2015. April 10-12, 2017. 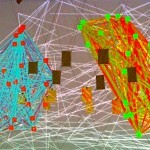 A three-day Projecting Particles workshop that added a new component. 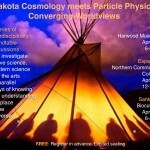 We invited Lakota artist, Steve Tamayo to lead a Lakota cosmology session to explore the parallel worldviews in science. CERN physicist, D. Steven Goldfarb led the particle physics session in person. Students then used Tagtool to visualize and share what they learned as animated stories projected from inside a Lakota Tipi. The workshop curriculum was guided by Dr. Greg Cajete, UNM professor of Native American studies and author of Native Science; Laws of Interdependence. 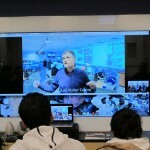 Workshop video. In addition to the workshop we organized three public presentations and round table discussions in Taos, Santa Fe and Espanola. July 14-16, 2016. 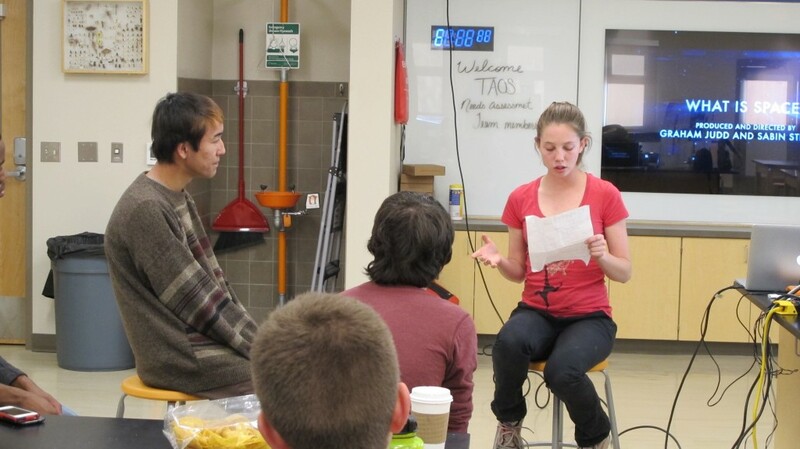 A two-day Projecting Particles workshop was held at the Los Alamos Teen Center in conjunction with the Los Alamos ScienceFest. 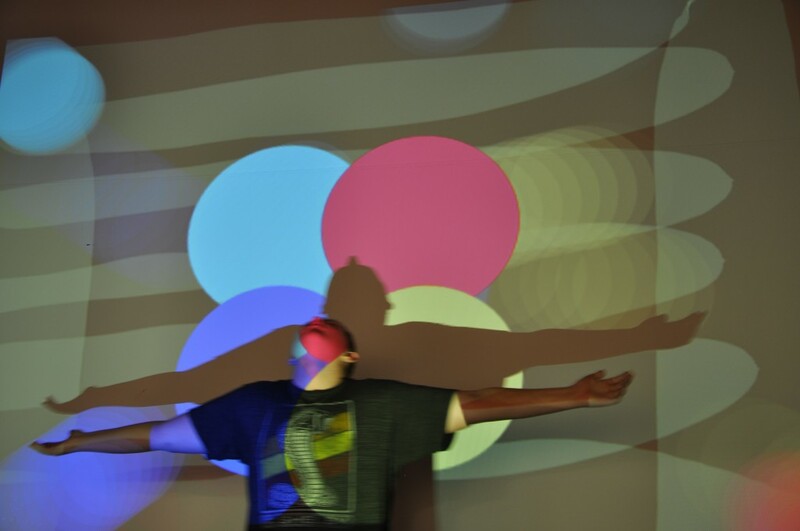 Students learned about particle physics and then explored Tagtool to create animations to project onto the Teen Center for the Summer concert at the park. 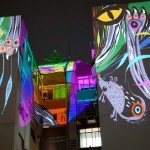 At the end of their performance students led a live paint session with the public, allowing kids to try their hand at painting onto the building with light. March 18-26, 2016. ATLAS@CERN will be sending Michael Wadness, a high school physics teacher from Medford High School near Boston with a doctorate in science education, to lead the exciting International Masterclass at Taos High School. Sally Seidel, physicist from UNM Albuquerque will give a special presentation on Saturday March 19. 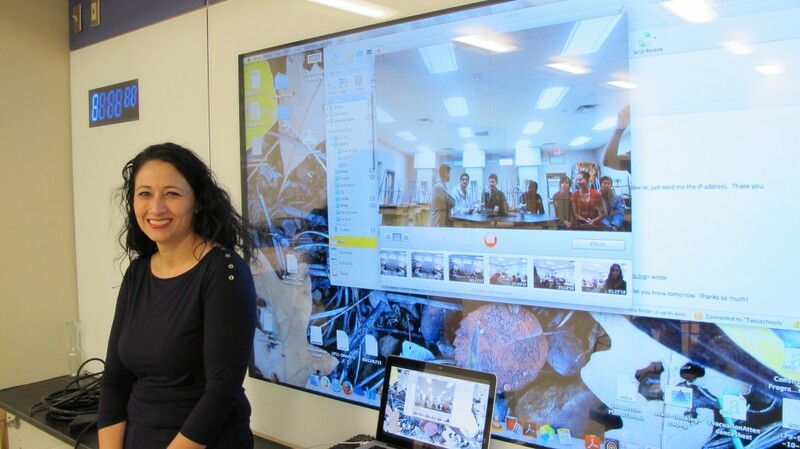 Students then continue with the three-day workshop and coordinate and document a live projection on March 24, 25. 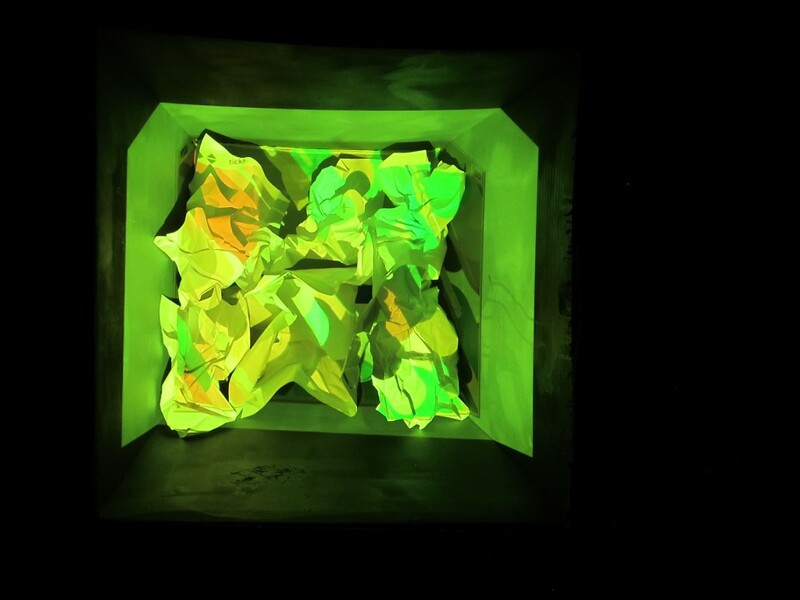 Then on March 26th for the Artist Talk at The Harwood Museum from 2-4pm, students join Agnes Chavez, Marcel Schwittlick and Robert Schirmer, artist/creators of the physics- inspired installation, Origination Point. 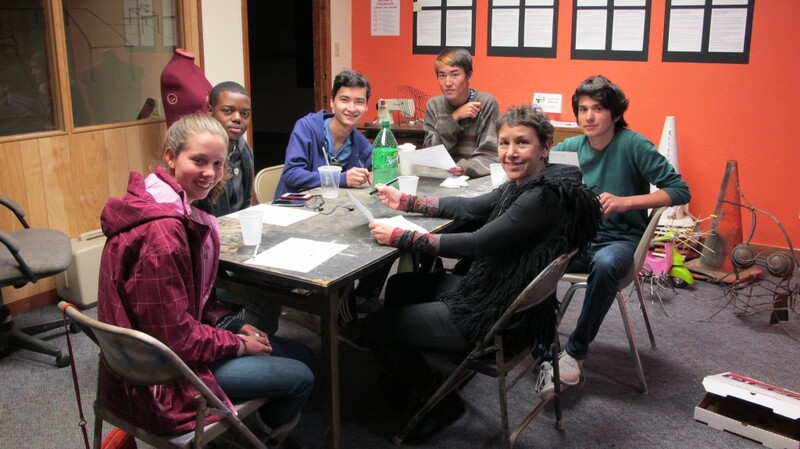 Together they will share how they have created work inspired and informed by particle physics. See the full agenda on the Quarknet site. April 23, 2016. Teen leads from the Harwood Museum-STEMarts LAB collaboration will work together to create a coding corner station for this fun Maker event. Using NetLogo, a programmable modeling environment for simulating natural and social phenomena, students will create and display an interactive project art display inspired by particle physics. 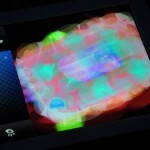 Participants will be able to interact with the code to change the imagery. 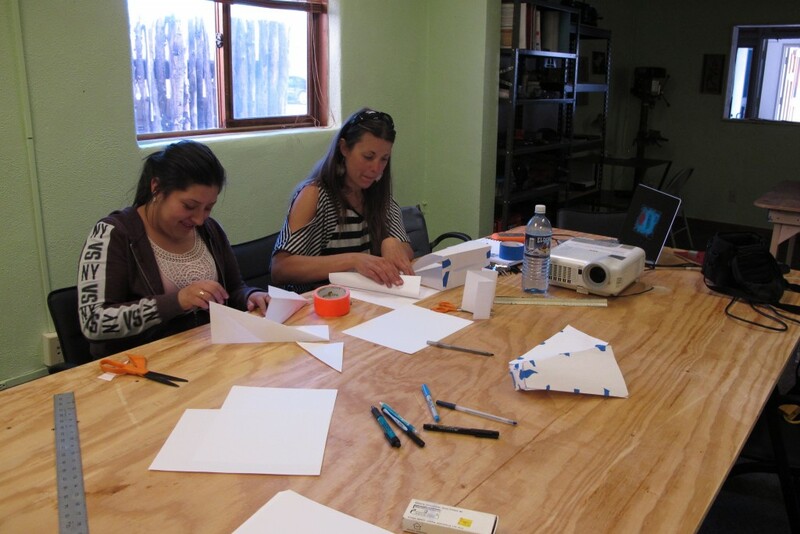 This workshop evolved from artist residency at Santa Fe Art Institute. June 2013. 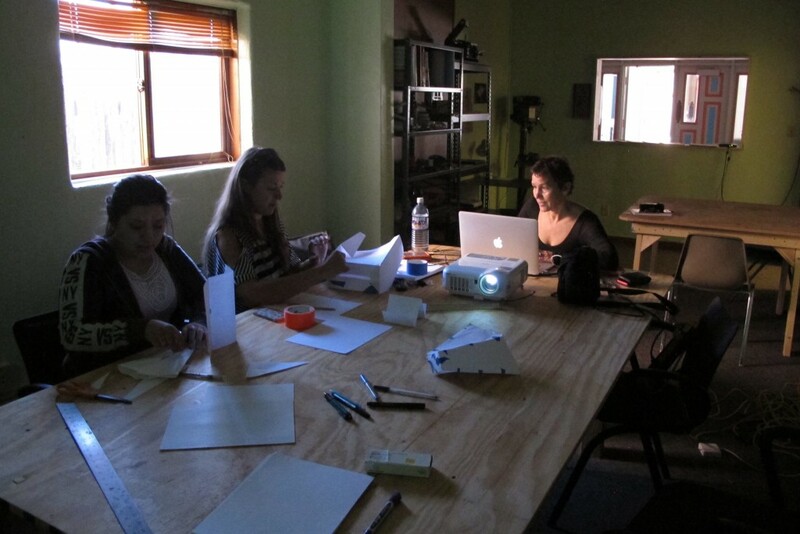 Our first Projecting Particles workshop took place at the National Hispanic Cultural Center June 2013 and was part of the 516 Arts exhibit Digital Latin America. 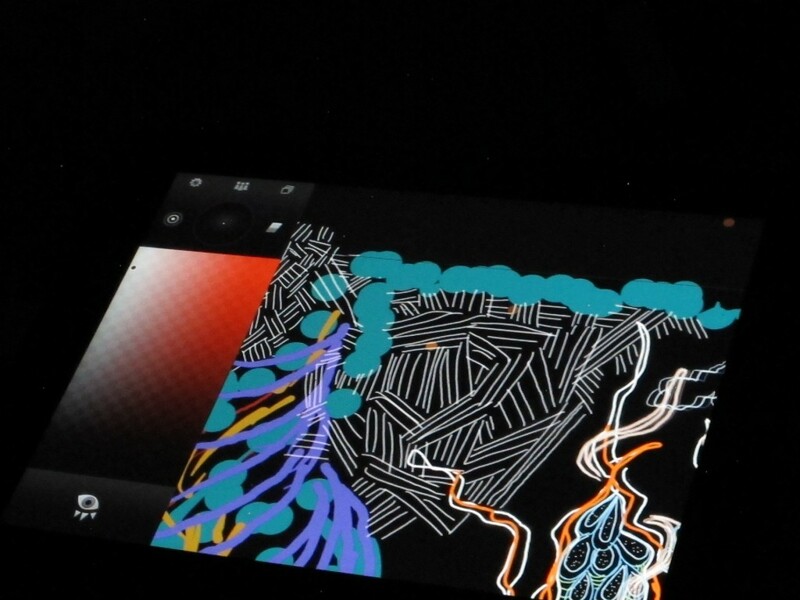 Students had a virtual tour of ATLAS control room and learned to use Tagtool to create physics-inspired art. Supported in part by Los Alamos National Laboratory. September 2014. 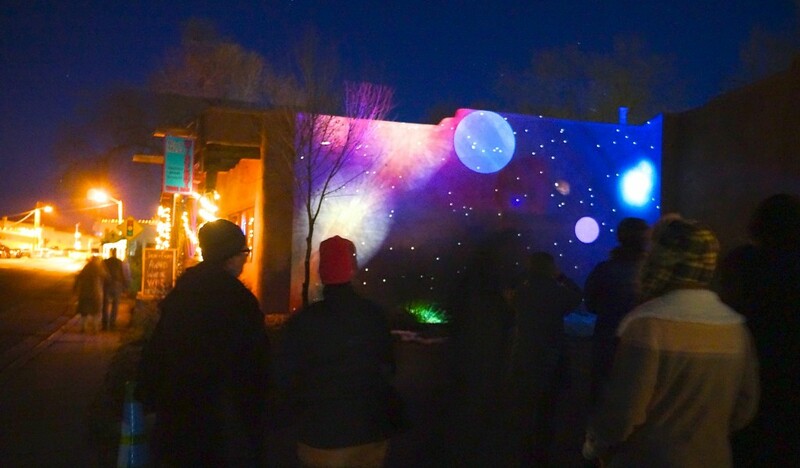 Markus Dorninger, artist/Tagtool app developer, joined Agnes Chavez to teach a Projecting Particles workshop culminating in a student projection performance for The PASEO, an outdoor participatory art festival. Supported in part by Los Alamos National Laboratory. May 2015. 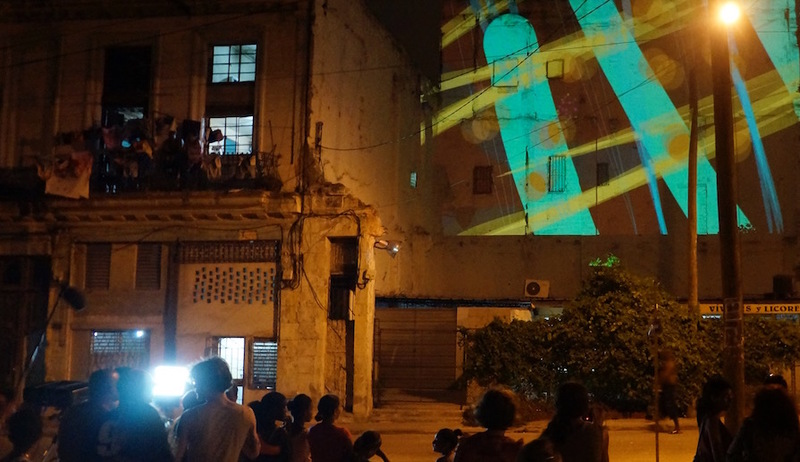 Agnes Chavez was invited to share a Projecting Particles installation and youth workshop for the Havana Biennial. She formed a team which included artist programmer, Marcel Schwittlick, sound engineer, Robert Schirmer, physicist, CERN researcher, Dr. Luis Flores Castillo, and workshop artist, Markus Dorninger. Together they delivered the installation, Origination Point, and 2-Day workshop at a Havana High school in Cuba. December 2015. 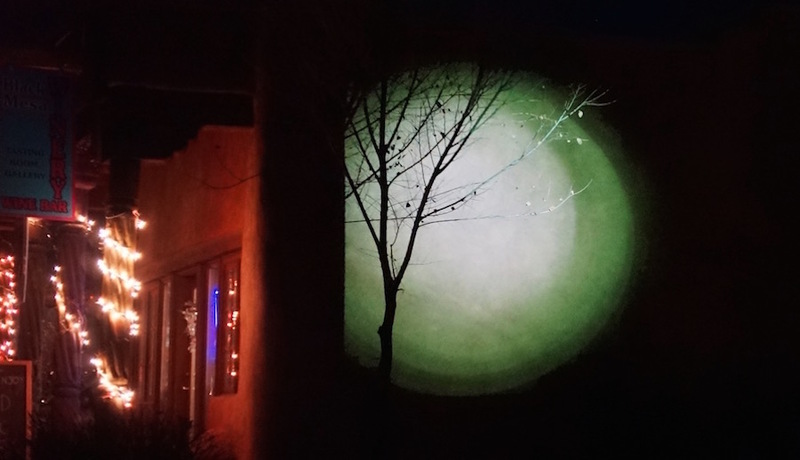 The first Projecting Particles at the Harwood workshop took place in December as part of the Lighting of Ledoux holiday event. 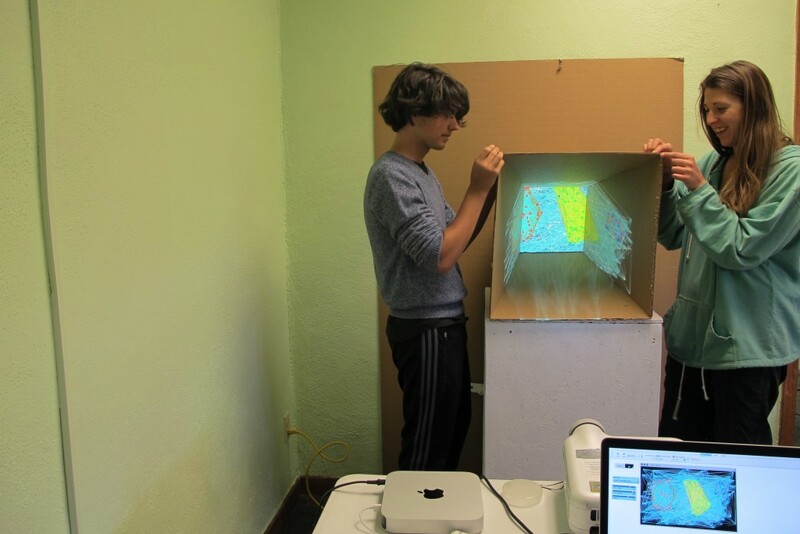 This was part of a collaboration between The Harwood Museum and Agnes Chavez which delivers a series of Teen-Led Projecting Particles workshops and events that will take place at The Harwood 2015/2016. February 2016. 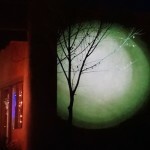 Projecting Particles workshop was held at NMSA in Santa Fe to guide students in the making of projection installations for the first annual school-wide New Media Arts Festival.